Samsian Ltd has a transparent and straightforward charging structure with a NO CALL OUT FEE policy. Working efficiently means we can keep our rates extremely competitive whilst still delivering a ‘best value’ service all the time. Our hourly boiler & cooker repair rates are fixed too, with no hidden extras or additional call out charges. 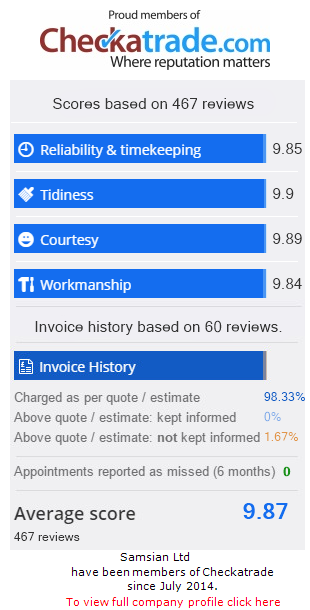 This means when you book a service repair call, you will know exactly how much we charge before we even arrive. Rest assured though, most diagnostic & repair visits are completed within the hour and even if the first hour is likely to be exceeded, our engineer will always be able to give you an estimated duration beforehand & because we only charge in 30 minute increments after the first hour, you will only ever pay for the time you actually need us. Call Samsian Ltd today on 01732 885882 or use our contact form to find out more.